Employees with a physical or mental disability may sometimes need special accommodations in order to perform the essential functions of their job. For example, an employee confined to a wheelchair may need modifications to be made to their work space; someone battling severe depression may need a temporary leave of absence to seek treatment; a worker with arthritis may need a special orthopedic chair to relieve pain. So long as the request for an accommodation is reasonable, New Jersey and federal laws require employers to grant it. 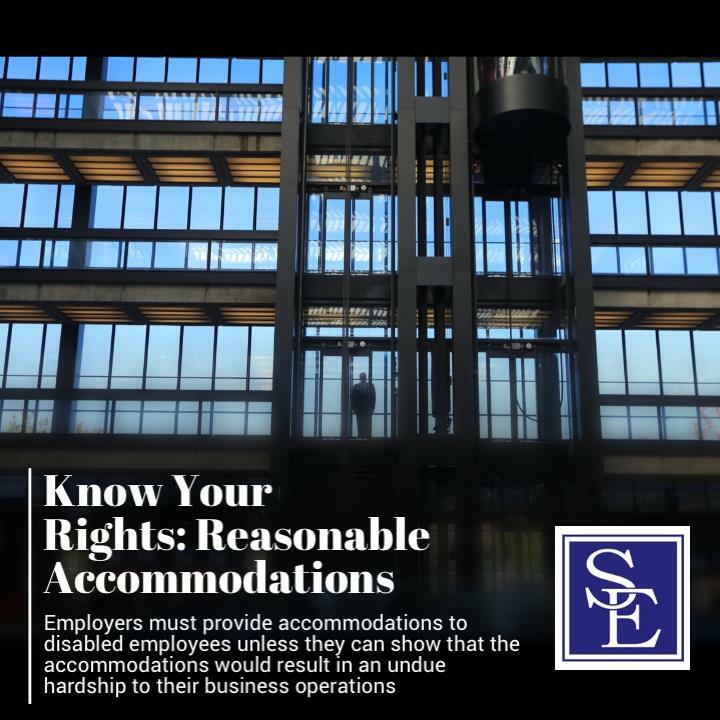 If the accommodation does not put undue strain on the employer (whether financially or logistically), the employer must honor the employee's request and provide the reasonable accommodation. The failure of an employer to accommodate reasonable a request of a disabled employee may be unlawful in certain circumstances and grounds for a discrimination claim. The New Jersey Law Against Discrimination requires employers to provide reasonable accommodations for their handicapped employees unless the nature and extent of the employee's handicap reasonably precludes job performance. In a disability discrimination lawsuit alleging failure to reasonably accommodate, the employee must show that he or she (1) has a disability; (2) is otherwise qualified to perform the essential functions of the job, with or without the accommodation by the employer, and (3) nonetheless suffered an adverse employment action because of the handicap. An employer's duty to reasonably accommodate is triggered when an employee requests assistance to perform their work duties as a result of their disability. In requesting the accommodation, the employee need not put the request in writing or even use the phrase reasonable accommodation. An employee may use plain English and need not mention the New Jersey Law Against Discrimination, Americans with Disabilities Act or any other legal source requiring accommodation. While there are no magic words to seek an accommodation, the employee, however, must make clear that assistance is desired for his or her disability. Examples of a workplace reasonable accommodation may include making facilities ready accessible and usable to handicapped individuals, job restructuring (including part-time or modified work schedules), medical leaves of absence, acquisition or modification of equipment or devices or job reassignments. Once the employee requests assistance from his or her employer, both the employer and the employee have a duty to act in good faith in the search for appropriate reasonable accommodation. To determine what appropriate accommodation is necessary, the employer must initiate an informal "interactive process" with the employee. The "interactive process" is used to identify the potential reasonable accommodations that could be adopted to overcome the employee's precise limitations resulting from the disability. To show that an employer failed to participate in the interactive process, a disabled employee must demonstrate that (1) the employer knew about the employee's disability; (2) the employee requested accommodations or assistance for her disability; (3) the employer did not make a good faith effort to assist the employee in seeking accommodations; and (4) the employee could have been reasonably accommodated but for the employer's lack of good faith. 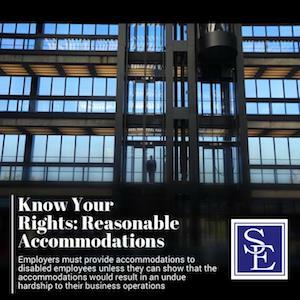 An employer need not reasonably accommodate a disabled employee if it can show that the requested reasonable accommodation would impose an undue hardship on the operation of its business operations. When employers utilize this "undue hardship" defense, courts will consider factors such as the overall size of the business in terms of employees, number and type of facilities and budget, the nature of the operations, including the composition and structure of the workforce, the nature and cost of the accommodation needed and to the extent to which accommodation would require waiver of an essential requirement of the job as opposed to a tangential or non-business necessity requirement. Whether an employer has made a reasonable accommodation, engaged in the interactive process, or has determined that the requested reasonable accommodation poses an undue hardship of the employers business operations are all determined on a case-by-case basis. If you believe your employer has discriminated against you because of your disability or has made a bad faith effort to accommodate your request for assistance, feel free contact us to schedule a consultation with one of our experienced employment law attorneys.